Our family loves lasagna — however, I don’t always love making lasagna because it seems like I get SO many dishes dirty and make such a huge mess of the kitchen. Plus, a full pan of lasagna makes way too much food for our little family — which means we end up eating lasagna leftovers for the next week or more (unless I freeze it). 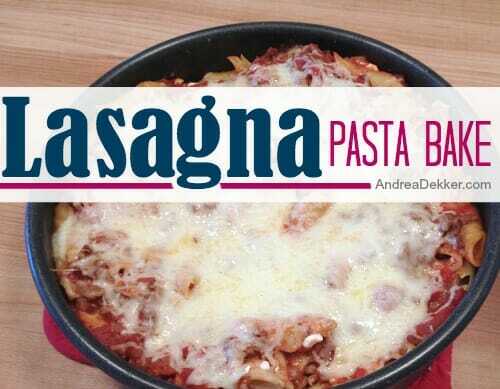 If you like traditional lasagna I’m almost positive you’ll love this recipe too! Makes one 9″ x 13″ pan or 2 smaller pans. In a large pot, boil pasta until tender. Drain (but do not rinse). Dump entire container of cottage cheese over hot noodles and stir until combined. Set aside. While noodles boil, brown meat in a large frying pan. Drain grease and return pan to stove. Add tomato paste, diced tomatoes, pasta seasoning and water to the frying pan and simmer until thick and bubbly. Add cooked meat into the tomato sauce and stir. Bake uncovered in preheated oven for 20-30 minutes — or until cheese is melted. 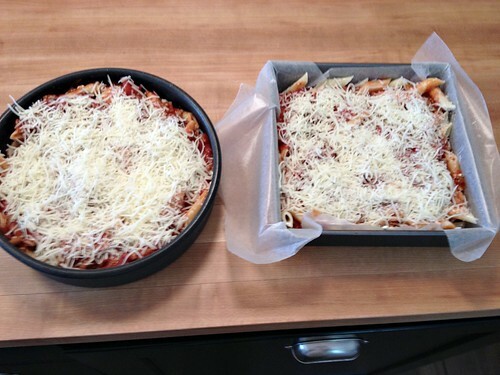 I can usually get this meal in the oven in about 20 minutes (even less time if I already have the meat cooked up in the freezer) so it’s definitely faster and easier than traditional lasagna recipes. Plus, I only have 2 pans and a spatula to wash! This is a real kid-pleasing recipe and is also great for pot-lucks or other group meals. Of course, you may feel free to play with the ingredients to fit your tastes. Maybe use your favorite pasta sauce, add a few seasonings or spices, play with various cheeses — I really don’t think you can mess this one up! This is definitely a keeper! I made 2 pans intending to freeze one, but they didn’t last long enough. We loved this recipe. 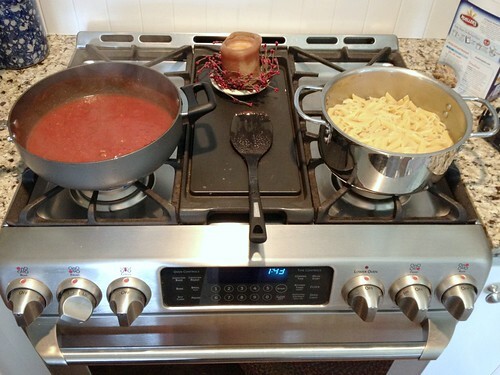 I only had spaghetti noodles and they worked great…like baked spaghetti that tastes like lasagna. Also, we don’t have meat very often so I cut up small bites of veg meat we had on hand, sauteed, and stirred it in. Very tasty. I made this about a month ago and my kids loved it so much they have brought it up asking me to make it again at least five times! so I had to search it on your site to make it this week. Thanks for sharing — glad you guys liked it! Looks amazing!! Wondering what is the best way to freeze the second batch? Thanks Kristin — and as for freezing, just wrap it up in plastic wrap and aluminum foil and pop it in the freezer. No special or complicated instructions! I made this for dinner last night. It was simple to make and tasted great! My husband and daughter loved it! Thanks for letting me know — glad you enjoyed it! Just made this with summer veggies instead of meat! Spinach, mushrooms, zucchini, bell peppers. Can’t wait for dinner and so excited to have one to freeze! Thanks for the recipe! yum — that sounds awesome! My favorite recipes are those that can easily be doubled – one for dinner and one for the freezer! Thanks so much – this one looks delish. This recipe looks good, and I like the idea, something easy to serve with a spoon, great for pot lucks! 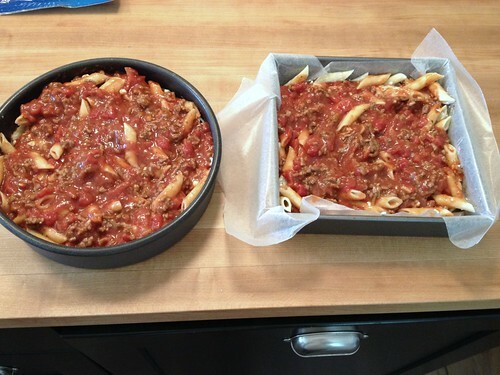 You could make a 9 x 9 pan of regular lasagna with probably the same amount of dishes and time if you used the no cook noodles. They are smaller than the regular ones, perfect for a 9 x 9 pan! They do cost a bit more than the others, but they are worth it to me! I love your creamy cheesy chicken lasagna, so can’t wait to try this. Going to have to make the spaghetti sauce from scratch though because that’s why I grow tomatoes. 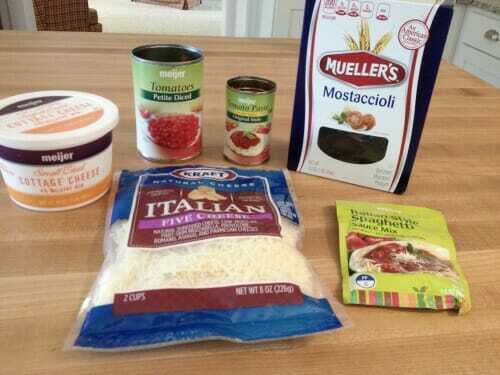 I store it up in the freezer for pasta dishes and pizzas. I do something just like yours with tagliatelle and it works out beautifully, it creates a fake layer just as lasgna sheets do. And if you let it set before eating, it cuts easy and keep its structure. I sometimes add in one layer of grilled eggplant slices, they give such a great flavour to the dish (if you like eggplant) or mushrooms. Here in Europe we have lasagna sheets that do not need to be boiled, so it gets easier to make one, but I still prefer it with italian tagliatelle eventhough italians would have me killed for calling that lasagna, haha! The tastes is the only one that matter! 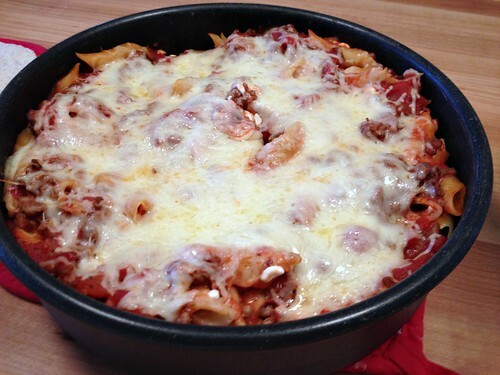 We make something like this and call it lazy lasagna! I’ve always wondered how cottage cheese tastes in pasta recipes compared to ricotta, but have been too chicken to try it. I can assure you that unless you have an intense hatred of cottage cheese, you will never know the difference. Plus, cottage cheese is A LOT cheaper at our grocery store! Oh, and I love the “Lazy Lasagna” name. I might have to steal that! This is one of my favorite dishes to make. We also put sour cream in at the same time as the cottage cheese. I totally agree about it being way easier than lasagna! This look great, but my family would move out if I used cottage cheese in anything. Do you think ricotta would work or would it be too dry? Thanks! I think Ricotta would definitely work just fine! 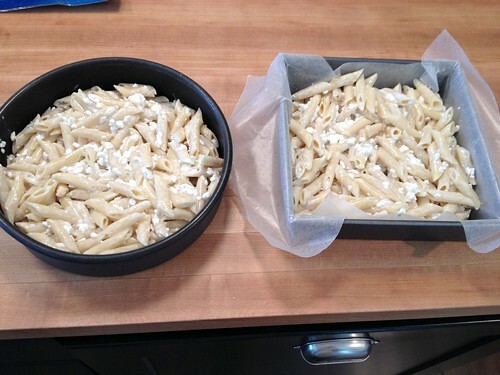 You could try mixing an egg in with your ricotta if you are worried about it being dry. I do that in a similar recipe with good results. Thanks for the egg tip, great idea! Do you freeze the second casserole after it’s cooked and then just reheat in the oven? We make something similar since lasagna always seems to be such a pain to make. I like to use Italian turkey sausage, and sometimes we just use half the package to make the meat go farther. I also like to put ricotta cheese in it and sprinkle a little crushed red pepper flakes on top. 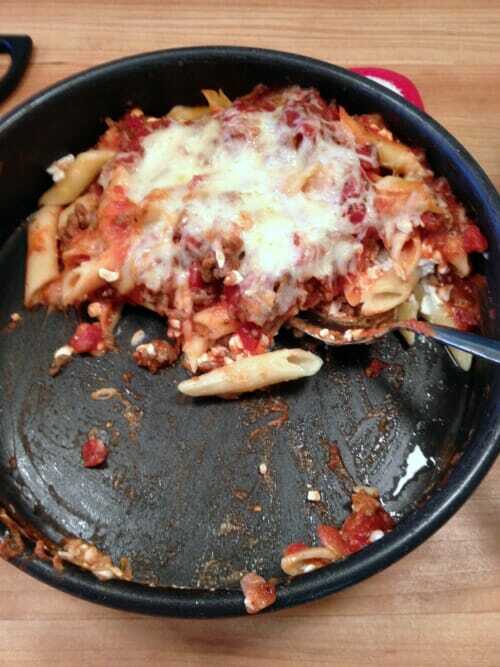 We call it “not lasagna,” haha. I’ve never mixed the cheese in with the noodles before adding the sauce. I’ll have to try that sometime. This looks yummy!